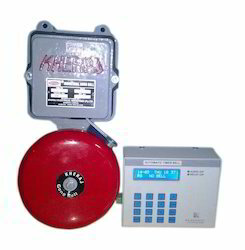 We are leading manufacurer of Automatic School Bell Timer (TBA) and our product is made up of good quality. 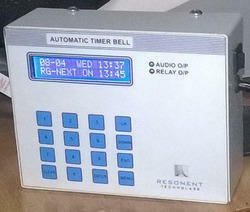 Bell time can be configurable. Easy programming of bell timings with bell period. Easy editing - insertion or deletion of programmed bell timing. No Manpower needed to ring a bell. Display: 32 Character digital display to show current date, day and time in the first row and next bell time in a 2nd row. Stand alone machine, no computers required to program or maintain the ringing schedule. can be programmed in Regular mode & 15 bells in other two modes. This is enough for two shift schools. WOF: weekly off day, any day of the week can be selected as weekly off. MOF: monthly off day, any date of the month can be selected as monthly off. 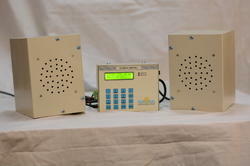 We are leading manufacurer of Automatic School Bell TBG and our product is made up of good quality. The user can set the ringing duration between 01 to 60 seconds. We are leading manufacurer of Automatic School Bell (TBA) and our product is made up of good quality. 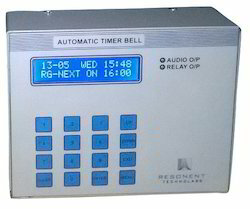 We are leading manufacurer of Automatic School Bell Timer (TBG) and our product is made up of good quality.